Rocket Sports & Entertainment Network » Blog Archive » What did we Learn Tonight as Bolts Dominate Hurricanes? The Tampa Bay Lightning was one of the pleasant surprises in the league last year as they improved 23 points in the standings on the way to an Eastern Conference Final appearance. 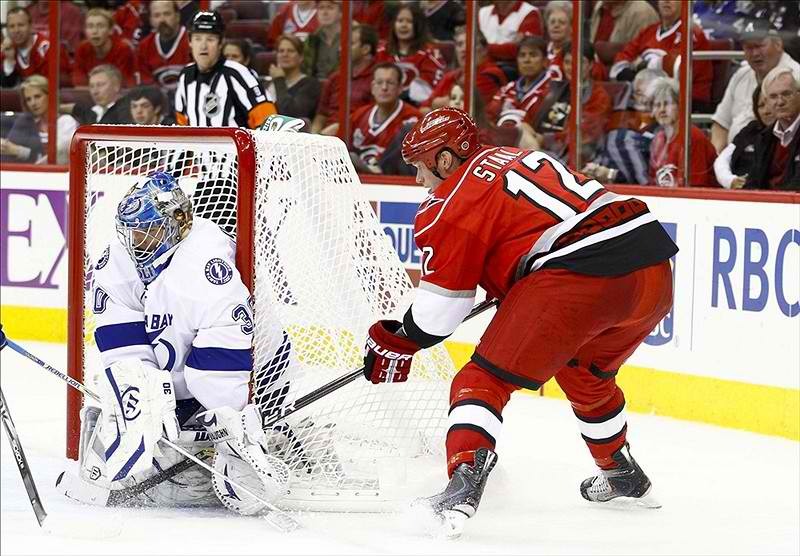 Tampa opened its season with a Southeast division opponent on the road against the Carolina Hurricanes. Lightning opened up with a dominant performance and a 5-1 victory on the road to open the season on a positive note as it continues its five game road trip to start. The Bolts have the Stanley Cup champs in Boston tomorrow night and a titanic early season tilt against the Washington Capitals on Monday. 5. Carolina will be a Jekyll and Hyde team this season. This team has a ton of talented young players who play with a ton of energy and a real will to win. Well tonight they were the best team on the ice in the first period as they took an early lead. However Dr. Jekyll made an appearance as they gave Tampa a two man advantage. Jussi Jokinen made a stupid play by shooting the puck toward the referee who was already calling a penalty on his teammate as he showed his frustration about the penalty call. Tampa then made the Hurricanes pay for its lack of composure by scoring on the advantage to take a 2-1 lead in the second period. It was another mistake by their captain Eric Staal who took a needless goalie interference penalty by knocking down Lightning goalie Dwayne Roloson to give Tampa another power play which they also converted to extend the lead 3-1. Carolina lost their concentration again as the bad play continued as 10 seconds later Tampa‘s Adam Hall capitalized on another lapse by scoring to make the score 4-1 and effectively turn out the lights on Carolina. 4. Dwayne Roloson turns 42 next week, but do not think he has gotten old. Roloson stopped 32 shots tonight and early in the first period some of them were spectacular as he kept his team in the game. As Tampa was down 1-0 in the first and Carolina was buzzing and Roloson kept his team in the game until they were able to take control of the game. As the night went along his defense in front of him gave him good looks at the puck and he was able to shut down the Hurricanes the rest of the night. Roloson is going to be a major key to the Bolts success this season as he has to stay healthy on his game mentally. 3. Jeff Skinner is good and is that Marty St Louis’ little brother playing in Tampa this year. Jeff Skinner finished the year by figure skating his way to 31 goals and the rookie of the year in the NHL. He started off his sophomore season by being one of the best players on the ice early in game. Skinner scored the first goal of the game tonight with a nifty little shot off a rebound that was a direct reflection of his excellent skating ability as he was able to skate away from the Tampa defender to bury the puck. You can expect another solid season from Skinner this year as he is going to be dominating at times with his skating ability. Ryan Shannon was signed as a free agent from Ottawa in the offseason and it was simply because Tampa wanted to corner the market on Marty St Louis type players. Shannon is a guy who 5’6 and 170 lbs. soaking wet with a work ethic like his the afore mentioned St. Louis and he worked the last couple of off seasons with his idol as well. 2. St Louis/Lecavalier/Stamkos, best trio of teammates in the NHL. Those three guys certainly did their part to make that statement look intelligent. St. Louis tallied a goal and assist to go along with 4 shots, Stamkos distributed 2 assists with 3 shots and Lecavalier scored a goal and 3 shots. The trio for the Lightning controlled the game the entire night which lead this team to a dominant statement 5-1 on opening night. 1. Tampa is going to be even better, really they are… Tampa opens the season with five games on the road but no worries to them they dispatched their division opponent in Carolina 5-1 as they prepare to travel for the first bit of revenge against Boston tomorrow night. This team did not overlook the first opponent which is the reason this team will be better. Their business-like approach with a quiet confidence that matches their head coach Guy Boucher and there General manager Steve Yzerman. All the talk from the team before the game and in training camp was a consistent day by day approach to this season and that last year was last year. Dominic Moore had the best answer I’ve heard, “We are thinking about today and tomorrow we will be thinking about today.” So for the national pundits who have already crowned the Caps division champs, not so fast, this team in Tampa will have something to say about it.